Download the complete PDF document! 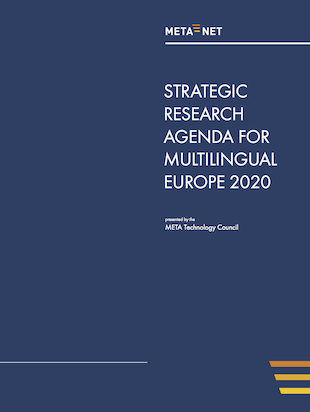 More than two years in the making, the final version of the META-NET Strategic Research Agenda for Multilingual Europe 2020 (SRA) was published on December 01, 2012. This document is the result of a discussion between hundreds of experts from research and industry. 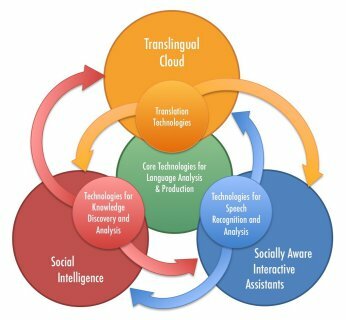 The main purpose of the SRA is to raise awareness for the field of Language Technology in Europe and attract the attention of and inform politicians and policy makers on the regional, national and international level in their decisions, especially with regard to the upcoming European funding opportunities Horizon 2020 and Connecting Europe Facility (CEF). META-NET Strategic Research Agenda for Multilingual Europe 2020. Georg Rehm and Hans Uszkoreit (editors). Presented by the META Technology Council. Heidelberg, New York etc. : Springer, 2013. Complete text and further information available at http://www.meta-net.eu/sra and http://link.springer.com/book/10.1007/978-3-642-36349-8/page/1.